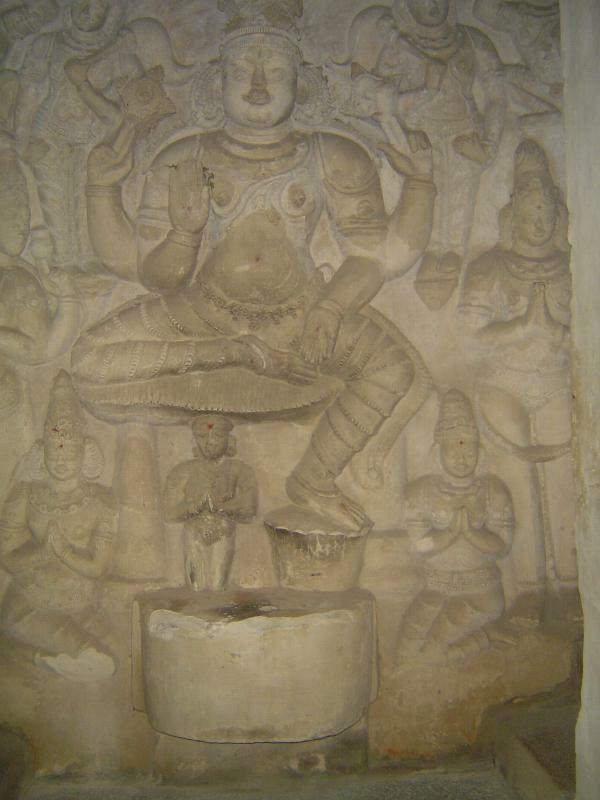 Vaikunt is Vishnu's heaven, and the form of the god most popular in Tamil Nadu is Perumal, or The Great One. 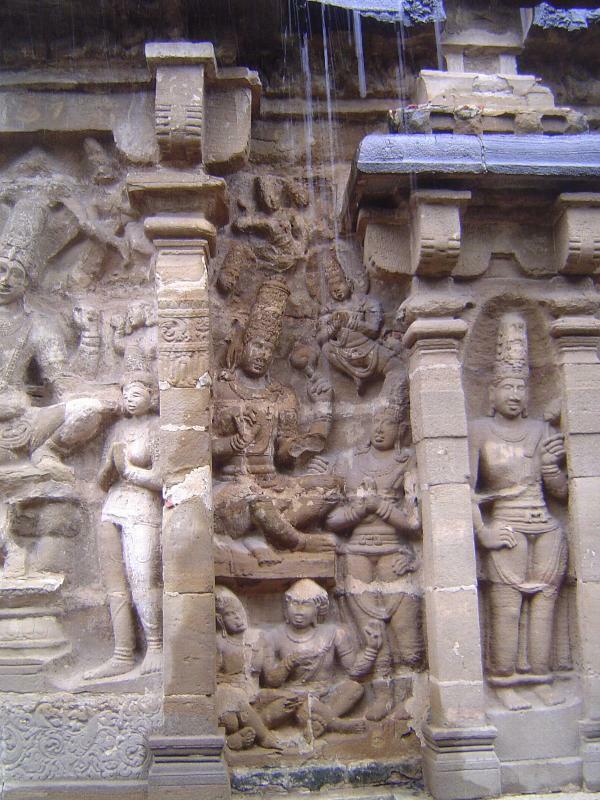 The temple's name, in short, means the great one of Vishnu's heaven, which is of course to say Vishnu himself. 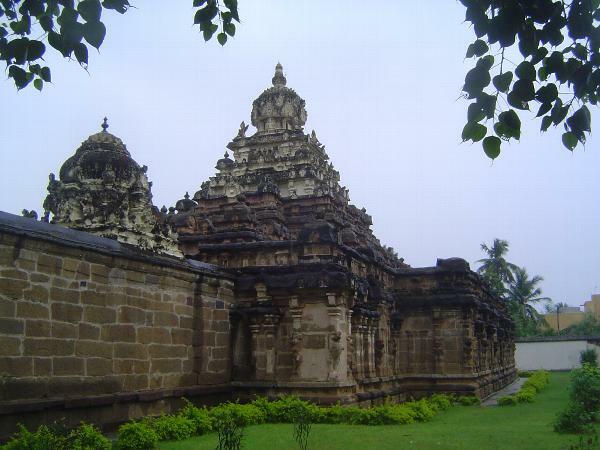 The temple dates from the mid-eighth century, which makes it a bit later than Kailasanatha, a mile and a half to the west, and much earlier than Ekambareswarar, a mile to the northwest. 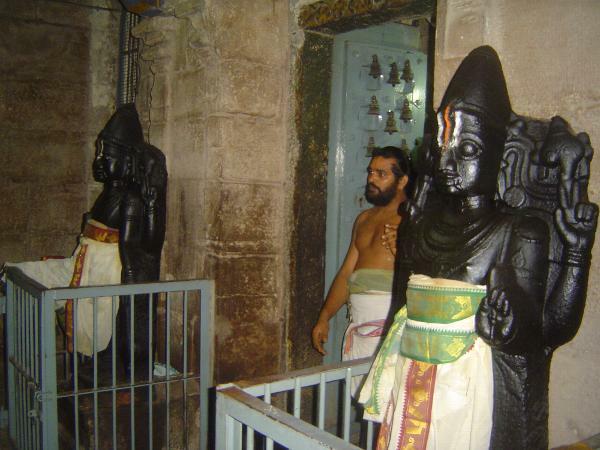 Vaikuntha Perumal is set in the midst of residential Kanchipuram: through the recent entrance gate you leave homes and shops and come to this porch and pole, both built half a millennium later than the temple proper, whose tower rises in the background. 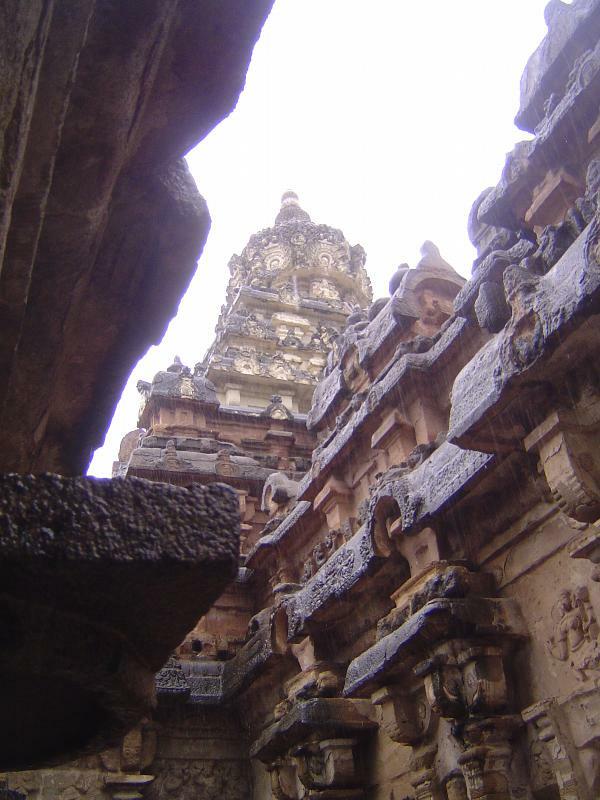 Step to the side and you see the temple's original wall, which encloses an unusually high vimana, literally a "palace" but figuratively a shrine and its enclosure. 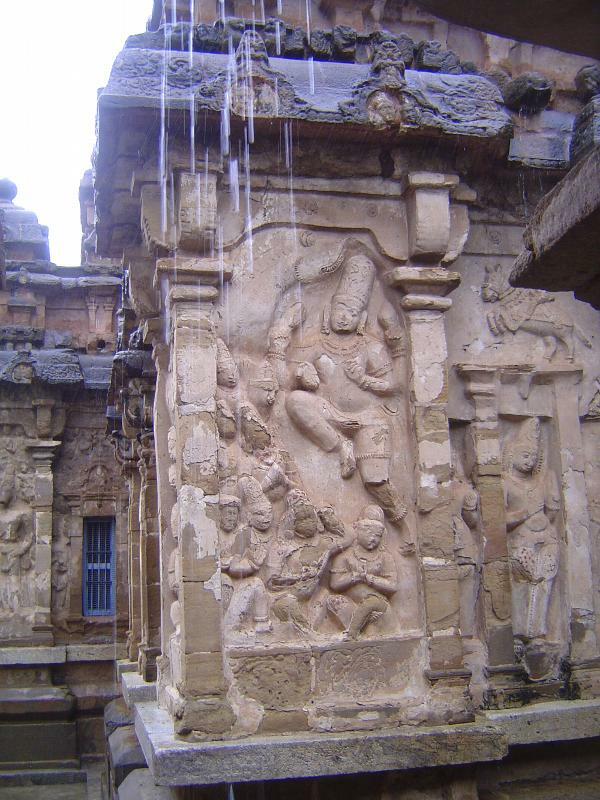 The style of the wall is characteristically Pallavan, with a moulding at the base, pilasters on the wall, and a parapet shaped like a curved or thatched roof. The vimana within has the same triple arrangement repeated at successively smaller sizes, so that the exterior wall appears as the base of the pyramidal set. 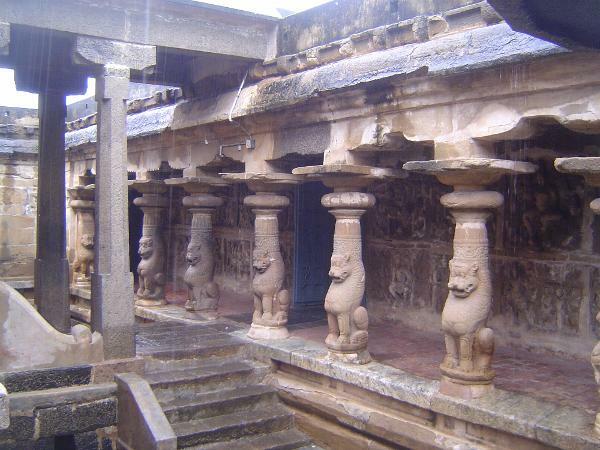 This Dravidian style, to give it its name, appears first at Aihole and Badami, but it was adopted by Rajasimha at Mamallapuram and carried over by Nandivarman II, the builder of Vaikuntha Perumal. The building is his "magnum opus," according to K.R. Srinivasan in The Encyclopedia of Indian Temple Architecture: South India, Lower Dravidadesa, 1983, p. 69. 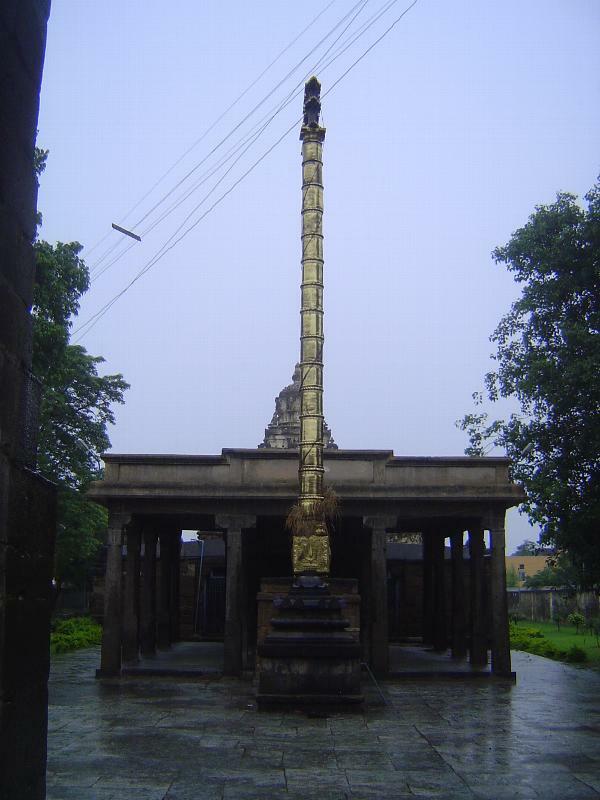 Behind that brass pole there is the late porch and hall, built by the rulers of Vijayanagar, who had conquered the formerly Pallavan territory. The men here are not waiting for the temple to open. (You can see the jail-style locked gates in the gloom.) 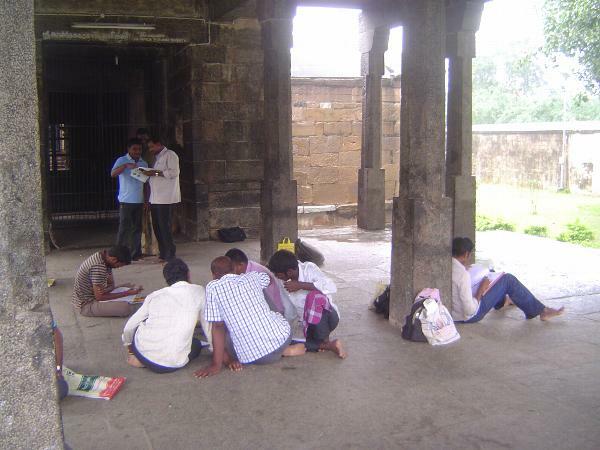 Instead, they have found a quiet and dry place where they can study for upcoming government-service entrance exams. The priest has come back from lunch and opened the steel gates. 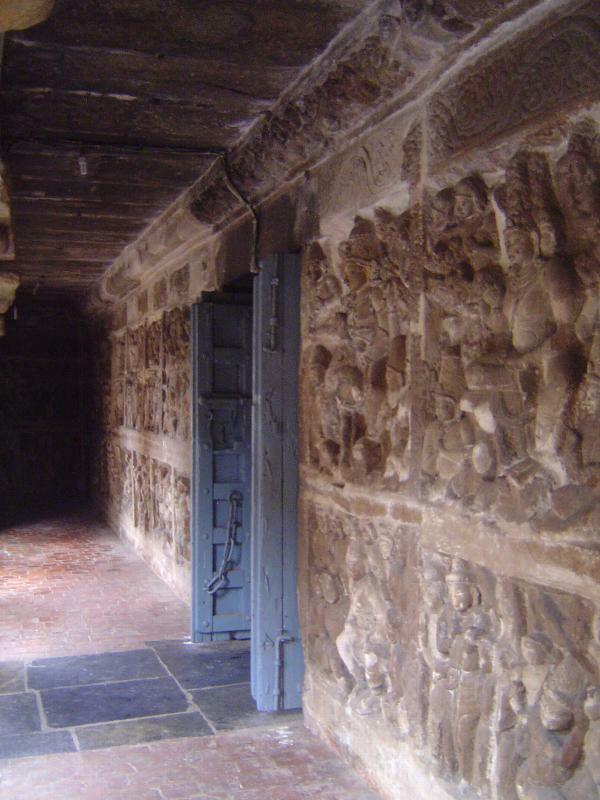 At the other end of the hall there is another door opening into the brightly lit enclosure between the vimana and the exterior wall. 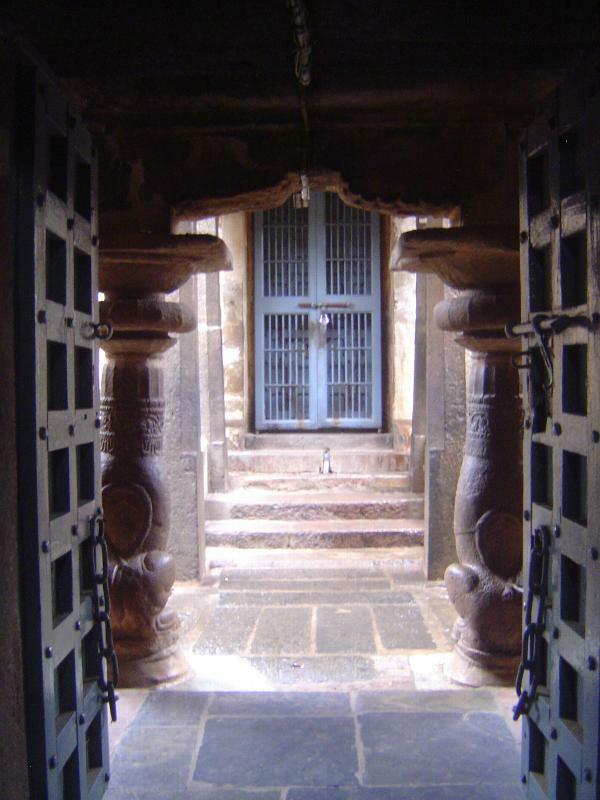 That space is the prakara, a path to circumambulate the still-locked shrine. 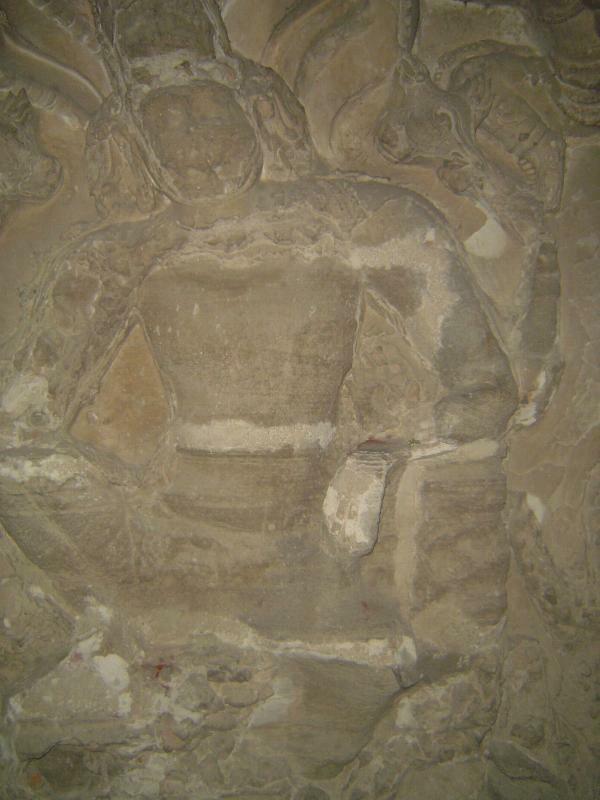 Here is one of those sculptures, from the lower register on the south wall. Another. 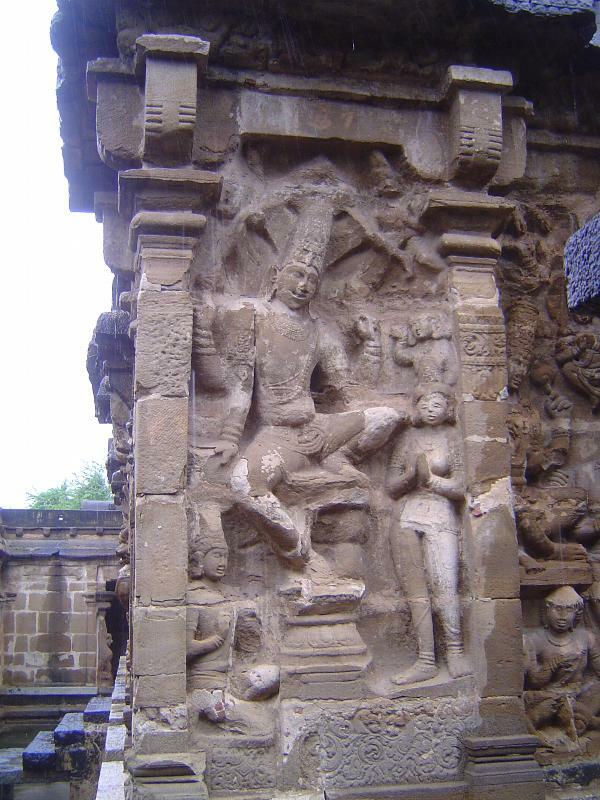 Minakshi (p. 30) identifies this as Paramesvaravarman I's war with the Chalukyas. And a third, presumably a battle scene. We've begun walking around the prakara and here look back toward the entrance; if we had gone straight ahead we would have crossed the bridge over the moat and come up a few steps toward the shrine. 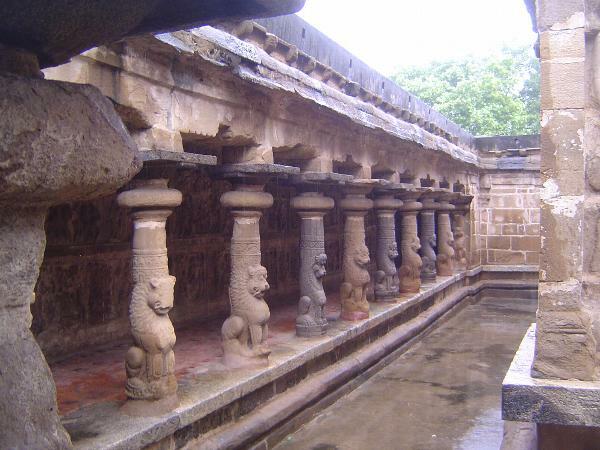 The colonnade is lined with lion-based columns. They are not merely decorative, at least according to Dennis Hudson, the author of two books on this temple. He writes that they "may be understood to have embodied Durga's brilliant conquering power to preserve the purity of this three dimensional mandala built to be God's residence." 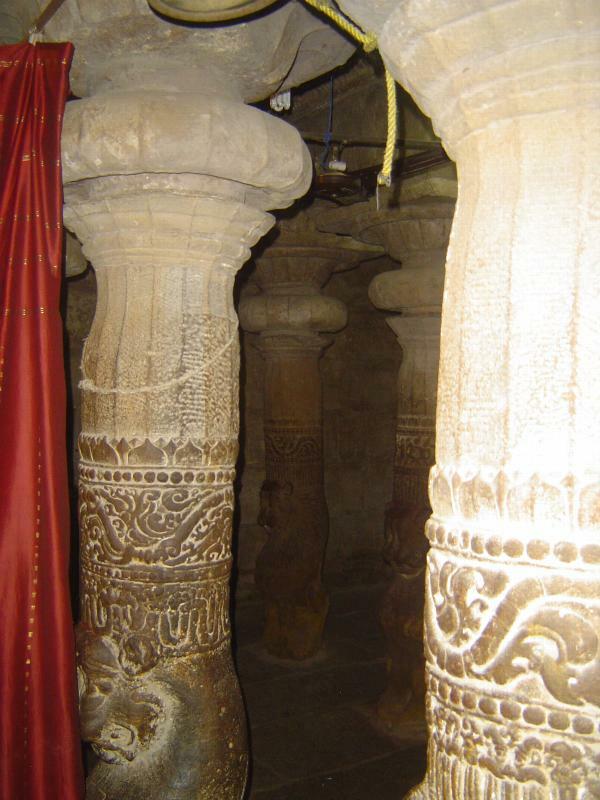 (The Vaikunta Perumal Temple at Kanchipuram, 2009, p. 15. The same sentence occurs on p. 64 of Hudson's longer book The Body of God, 2008. The shorter book is presented as a guide for visitors, but if so it ranks as the world's most recondite guidebook). 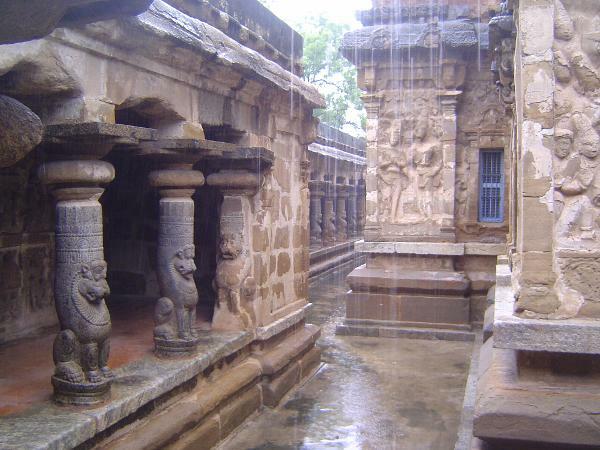 Here's a view of part of the north side of the prakara, which deviates from a square to allow a porch whose corner is on the right. Hudson sees the entire project as a recreation in stone of a mandala of five concentric enclosures. The shrine within the vimana is the innermost of these; the moat is the third; the exterior of the wall is the outermost or fifth. 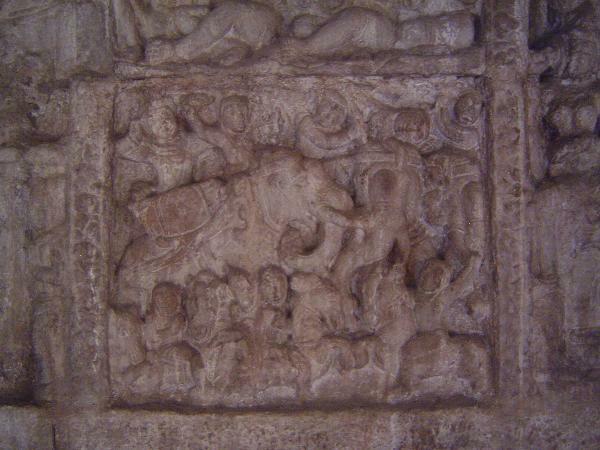 It's hard to get a picture of the vimana from within the prakara, but here's a brave attempt. 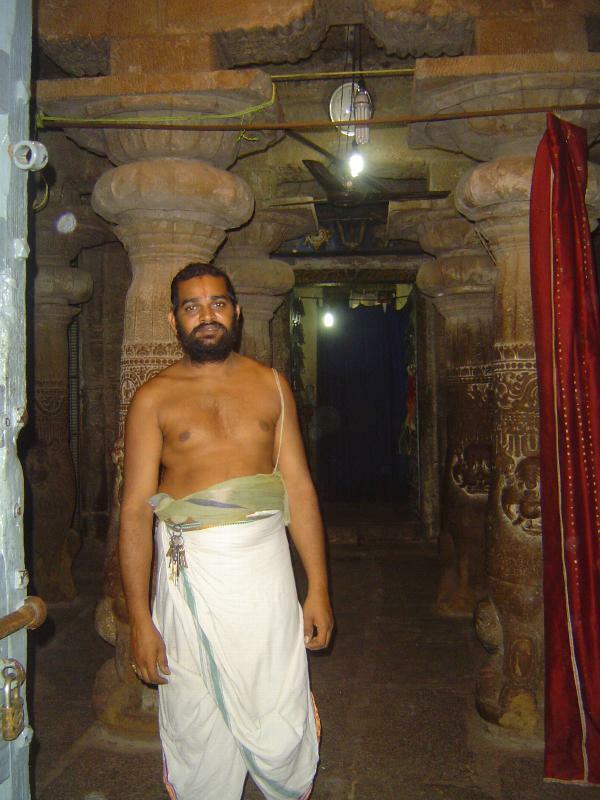 The unusual feature of this temple is that the shrine on the lowest level is not the only one. 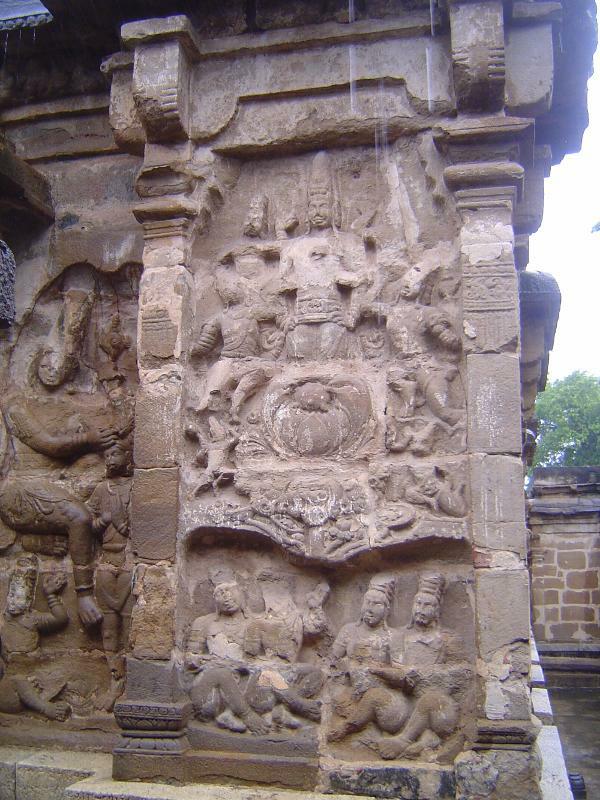 There is another image of Vishnu on the level above, and originally there was a third on the next level, though it is long gone. There is a fourth level as well, but the sanctum there has always been a void signifying... well, it's up for grabs. Sad to say, only the ground level is open. 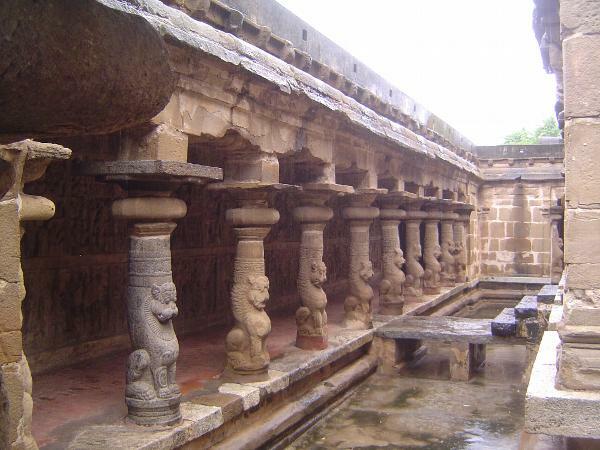 The second level, reached by stairs, is open to Hindus on a few annual ceremonies. The third level can be reached only by ladders and then only by temple priests. As for the meaning of the three levels, there the plot thickens. 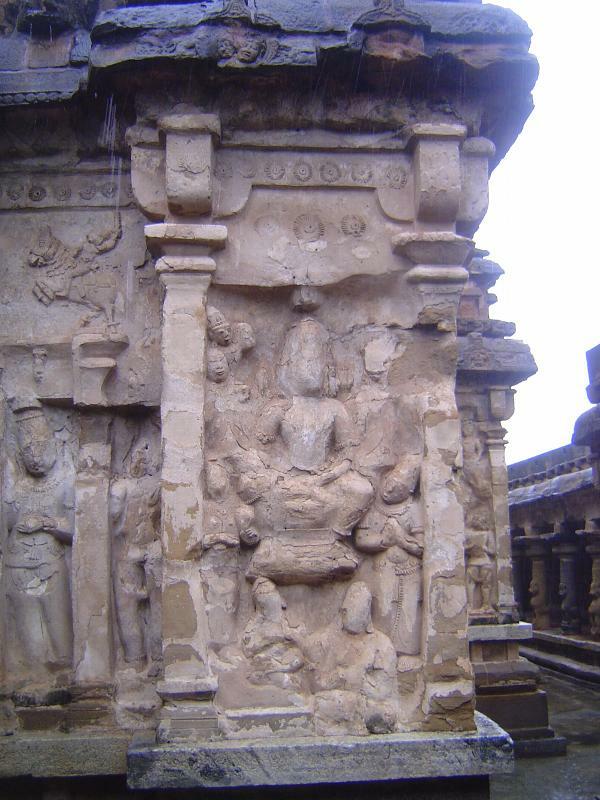 The lower one shows the god sitting; the one above shows him reclining; the missing one on the third level showed him standing. Is there a progression here, some kind of implied lesson? The stones aren't talking. They're sandstone, by the way. . The east side, with a bridge leading to a blocked entrance. 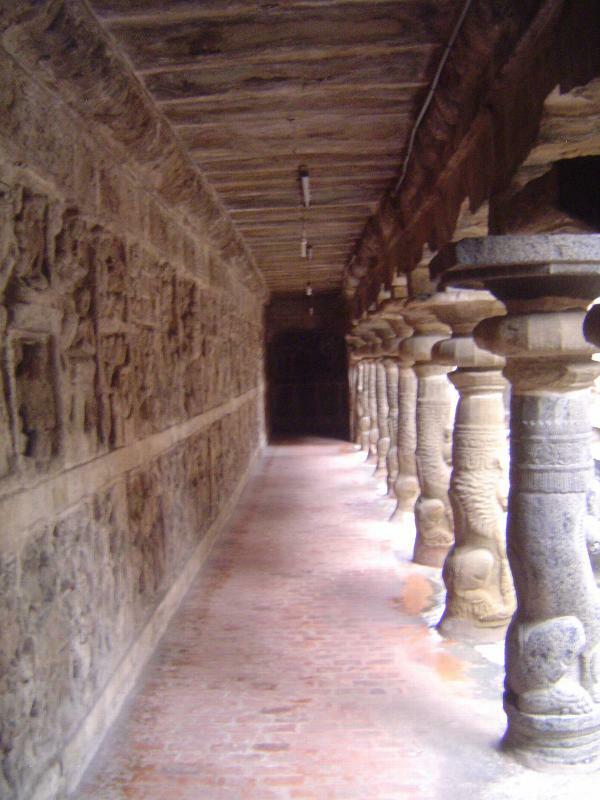 The carved wall and colonnade on the east side. Nice fluorescent tubes. The priest unlocks the door to the shrine. 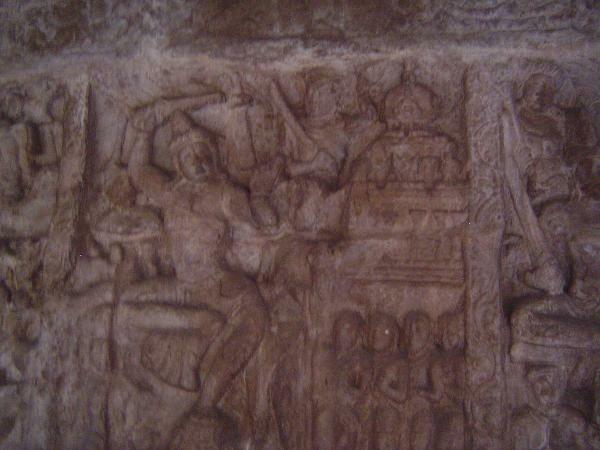 The image within is one of the many forms or vyuhas of the god. 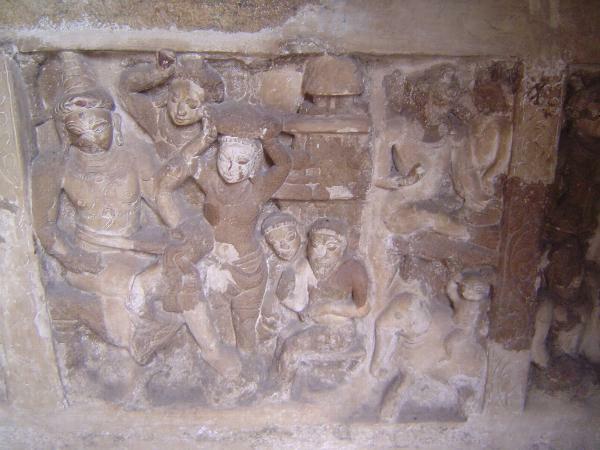 Three others are illustrated in reliefs that are carved on the wall of an interior corridor on this level. 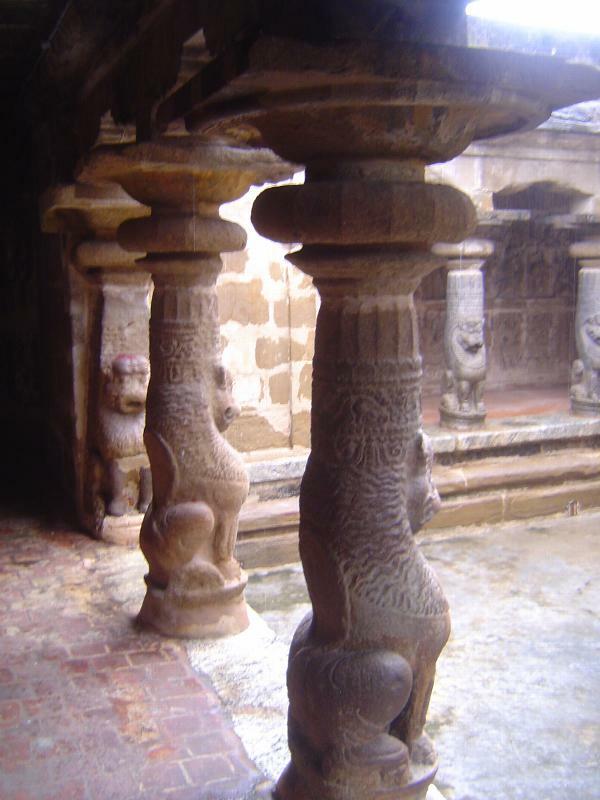 A side glimpse of the shrine, again with lion-base columns. 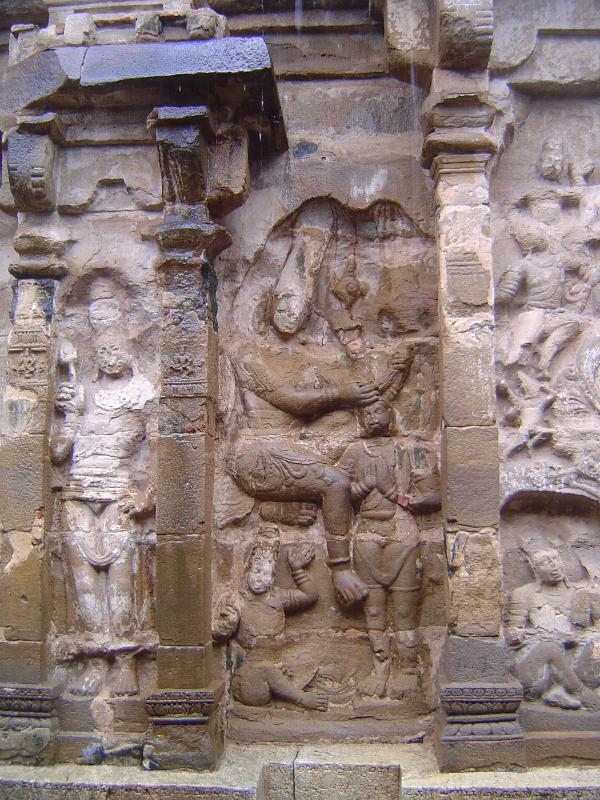 Here, in the north corridor, the Plower or Samkarshana vyuha gazes north through a window in the vimana wall toward Bharata, the world of human life. 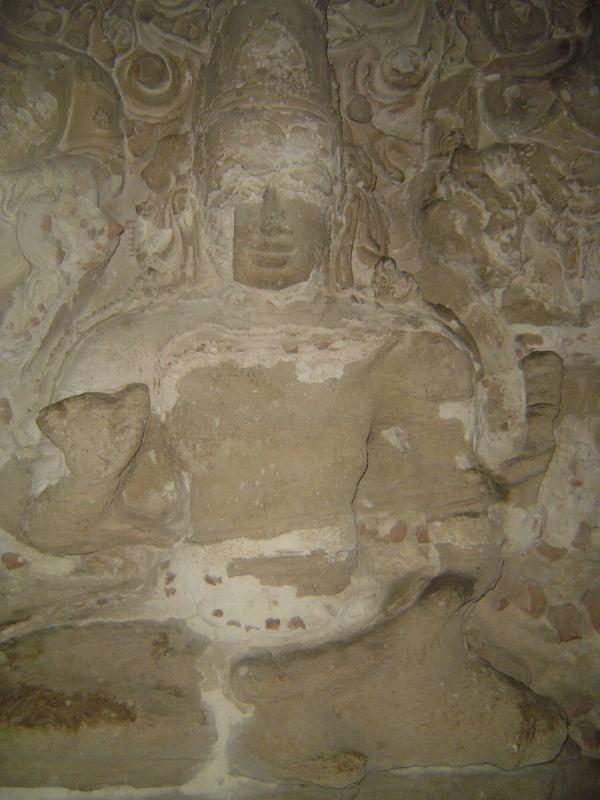 These forms are those assumed by Vishnu while reclining in a trance on the floor above. 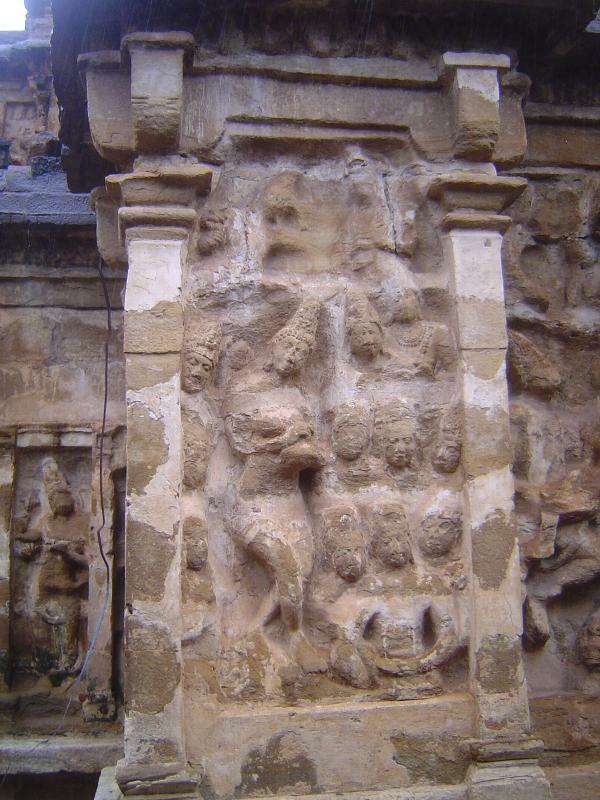 Here is the first of those transformations, Samkarshana, the Plower, with five cobra heads behind his crown. Like the other three vyuhas, this one is no longer used in worship. 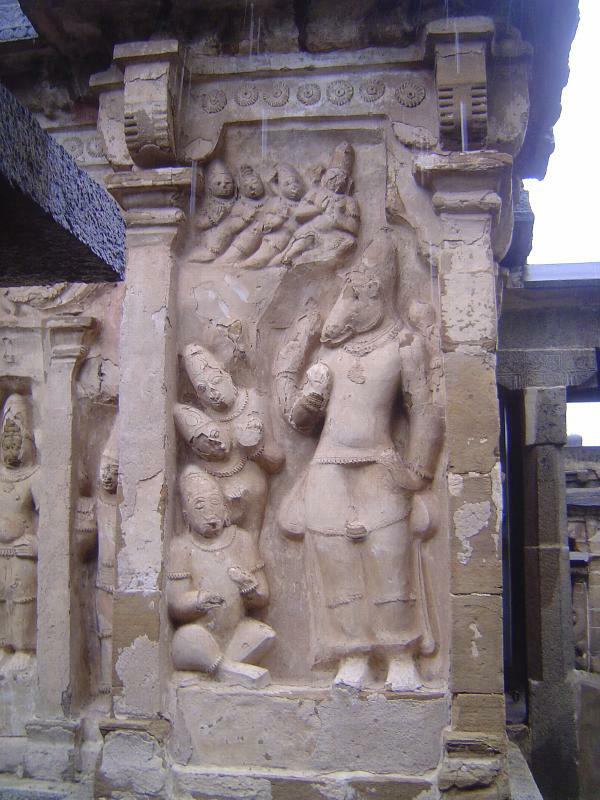 Pradyumna the Pre-eminently Mighty, the second formation, faces east to heaven. 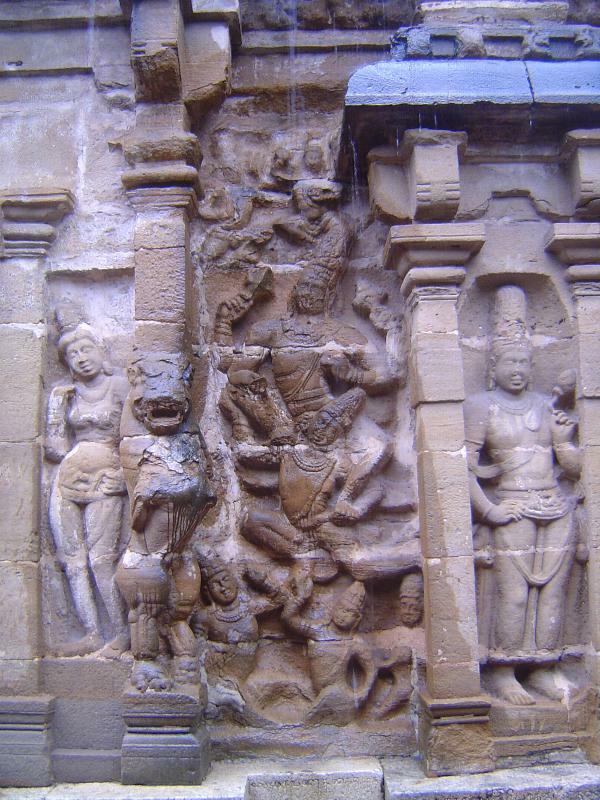 Aniruddha, the Unobstructed, faces south toward Lanka, the abode of demons. Wondering how to get to the next level? 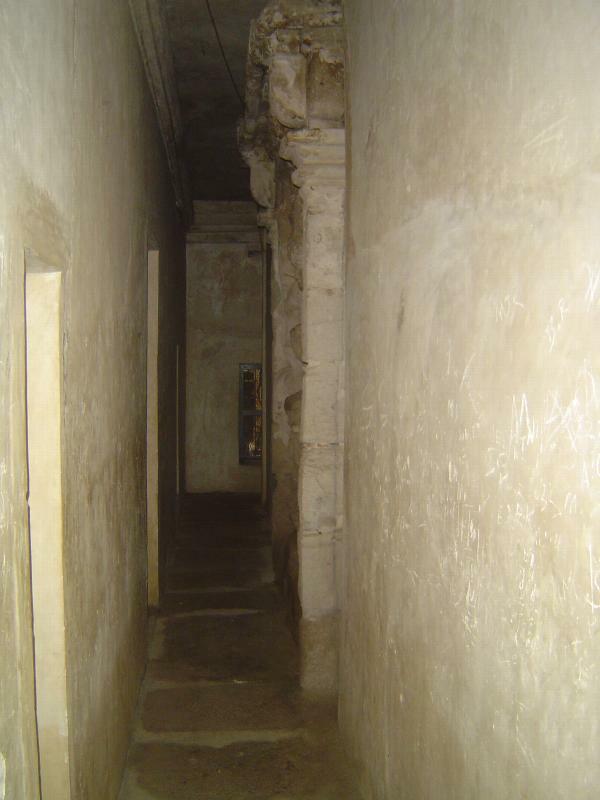 There are stairs, but they rise from an inner corridor between the one seen in the last few pictures and the shrine.